For many musicians, the choice between melody and dissonance is simple. Most choose melody, though they know theirs need to be neither hummable nor even memorable. Fewer choose dissonance, but do so intentionally, for art’s sake (if not to scare the squares). Curiously, Edmonton, AB’s Counterfeit Jeans chose both at once. They displayed this disposition on a self-titled EP in 2015, on which frontman Jed Gauthier’s guitar melodies flinch and fidget over an otherwise steady rhythm section. 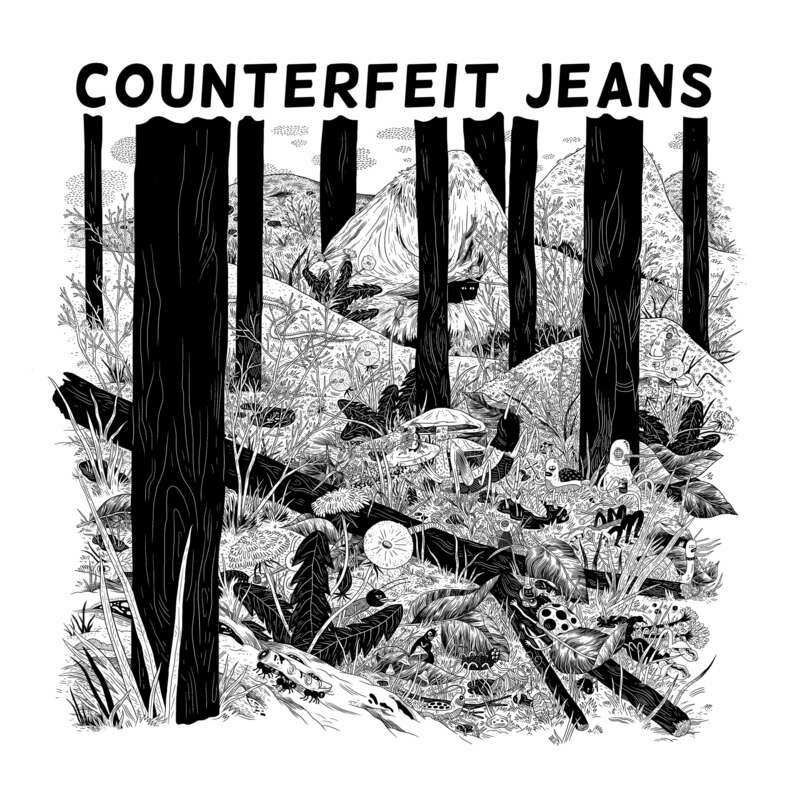 But it’s on Counterfeit Jeans, their debut LP, that the band fully embraces their melodic dissonance. Opener “Black Light” finds the band at its most tuneful; here, the harmonic guitars honk over Tyler Bedford’s stomping tempo and take center stage, even over Gauthier’s snarl. The next song, “No Desire,” is punchy and poppy; the cello that saws through each verse drones, adding a noisy depth to the sticky distortion and throbbing beat. The deeper one seeps into Counterfeit Jeans, though, the more dissonant it becomes. Spencer Heykants’s bass grumbles at the beginning of “Fairy Ring,” its menace met by squelching feedback. By the time the song builds into its chorus, it has devolved into a shouting match, Gauthier against his guitar, with the latter squealing obscenities in a drunken alien language. Never quite consuming any song, this noise becomes a reoccurring character that dances from track to track; it’s there on “Gemini” in the form of a gremlin guitar lick, on “Breeder” and its dizzy shuffle, in Gauthier’s yowl on “Generation.” And, at the end of the record, it manifests physically as “Disorder,” a nightmarish dirge in which Gauthier’s gauzy vocals disappear in the yawning bass, the skittering guitars, the etherial and existential hum. But, of course, all of these songs are lush with melody, complex in their dissonance. Counterfeit Jeans (both the band and its album) never succumb to noise even when they’re noisy, never topple into pop’s pitfalls no matter how catchy they get. These checks balance each other, but also challenge each other, positioning their debut nicely between too punk and not punk enough. It’s rare that a band can balance melody and dissonance, but Counterfeit Jeans pulls it off as if it’s the only choice they know.